HOME -> B2B Marketing -> Data & Analytics -> Do You Have a True B2B Marketing/Sales Partnership? Do You Have a True B2B Marketing/Sales Partnership? 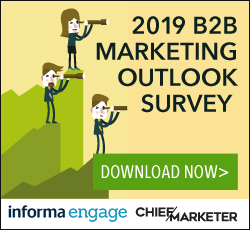 Over half of B2B marketing and sales departments think they have a great working partnership—but in reality that isn’t the case, according to recent research from Sparks Grove and Econsultancy. “Sales and marketing organizations need to adapt to a changing environment to drive business, and marketing must treat sales as an internal customer,” notes Rob Sherrell, vice president of Sparks Grove. Part of the problem is that sales was the dominant force for so long, and marketing teams often feel like their value and role is misunderstood. But now that marketing drives more of the early stages of consideration in the sales funnel, everyone has to get past their egos and work together, Sherrell says. For the research, Sparks Grove talked to about 425 companies. About a third were sales led, where B2B marketing is involved in the basic core functions like branding but does not have responsibility for revenue and only a small role in customer experience and product development. About eight percent were defined as marketing led, and there wasn’t a strong sales function at all. These were generally ecommerce firms. Fifty-eight percent characterized themselves as having a marketing-sales partnership but 30% of those had a “false partnership,” said Sherrell, because while marketing had some role in driving prospects and leads, it didn’t have any responsibility for customer experiences or product development. “Instead, sales is maintaining responsibility for those functions, and by nature sales seems to be short termed focused,” he says. What are the barriers for change? Like any classic management challenge, there needs to be a buy in from the C-suite. “You need to convince your leadership and prioritize appropriately—almost a third of respondents agreed that marketing having a greater involvement [in the sales process] would positively impact revenue,” he says.